I know of girls who use their looks to score freebies and get extra favours from people. Sometimes, I do it too or at least attempt to do so. So far, it hasn’t really worked for me. No one has ever sent a drink over to my table, or given me a free Frappucinno when I bat my eyelashes. This girl I know (no, she’s not my friend) just sticks out her chest, and guys go weak in the knees. *roll eyes* Okay fine, maybe I’m slightly jealous because she does it with ease, and I can’t. I went to Delicious twice in the same week (different outlet), and experienced a completely different level of service each time. Which is why I have to somewhat agree that often, better looking people get better service. If you look like you are a big tipper, you will probably get good service too. Back to desserts. Out of curiosity, I tried the peach frangipane (RM12.90) , which offered plump peach slices, almonds and custard nestled in a moist, cookie-like crust — a lovely balance of texture and richness. I loved the aroma and caramelised top on this dessert, and the vanilla ice cream was a perfect accompaniment. 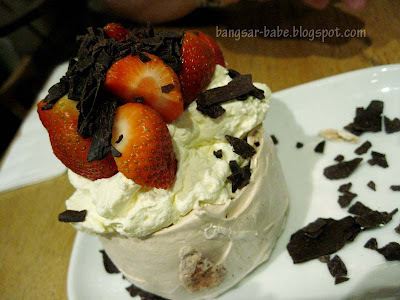 The chocolate Pavlova (RM12.90) comprised a baked meringue nest studded with strawberries, filled with whipped cream and topped with shaved chocolate. Nothing spectacular, but decent enough to warrant another order in future. 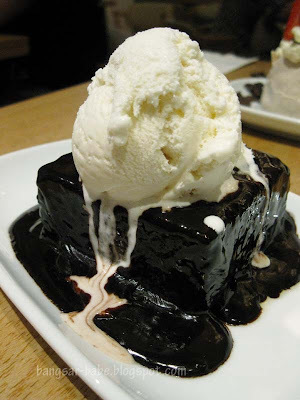 On days when I need TLC (tender loving care), the chocolate cake with ice cream (RM11.90) does the trick. Granted it is neither earth-shattering nor heavenly, this is still something I look forward to having with coffee every now and then. I’ve eaten this in both the Mid Valley and Bangsar outlet, and I prefer the former. 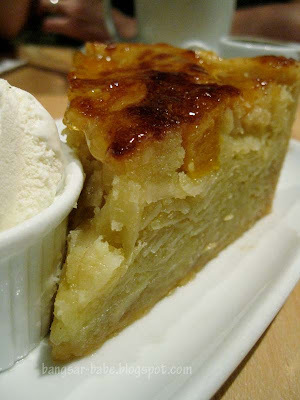 The desserts may be the same in all outlets, but the service makes a big difference. 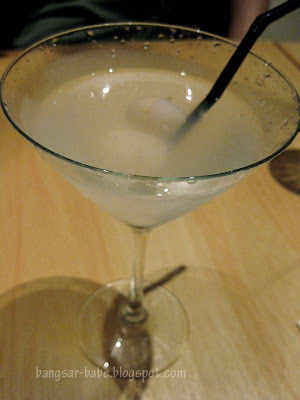 At Delicious Bangsar, my lychee martini was pathetic (RM 14.90) – don’t bother ordering it. I’m not sure if it has always tasted like this, or I was just unlucky. It tasted like lychee juice – hardly any alcohol in it. When I asked if they could put in more vodka in my “lychee juice”, the waiter told me I had to pay another RM15 for it. 0_o If that’s the case, I think I’ll stick to Telawi Street Bistro thank you very much. Verdict: Desserts are pretty good, but skip the martini. Extra RM15 sounds about right actually – Rm14.90 is very cheap for a lychee martini! hahaha … biased indeed. i cant gauge decent service from them neither, though i usually patronize the 1Utama outlet. Being a choc lover myself I thought the choc cake here was rather good. However, there was one point when we order the choc cake (it was when they were still in BV 1) the choc topping tasted like plastic. Looks like they fixed that problem now. I found the frangipane quite interesting. Something different from your average every day cakes. One thing I like about delicious is that the cakes ALWAYS come with ice-cream and I LOVE ice-cream. 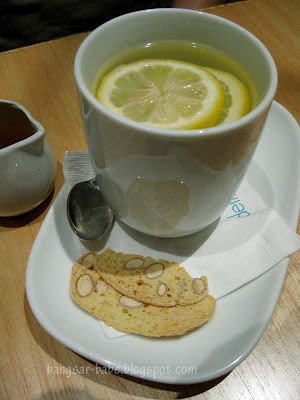 Cafe’s in Malaysia has never provided good service in my opinion. Not sure how LOOOOONG it takes to cut a cake. Not to say they are baking the cake, it’s already there, what else is there to do? They definitely do NOT deserve the SERVICE charge or ANY tips for that matter. Wei Jien – Well said! Not worth tipping at all! J – I ordered it because it was cheap, but if this is the kind of drinks they produce, I'd rather go to TSB for martinis. A glass cost RM25, but at least the drink tastes good! Hey, how'r u doing with life after the pageant? Its been awhile since I've been on here. I completely agree with you on ur hypothesis btw. When I go about on my eating sprees alone, quite often the waiters remain skeptical as to whether or not a 15 year old is capable of paying the bill. Its happenes in DELIcious quite alot. Brian – Life's been hectic. Yeah…you've been away from the blogsphere for a bit! How's everything going? I have a totally different experience. i remembering ordering scrambled eggs at MV and the quality was a lot lower that the one at Bangsar.